The words inside the quotation marks came from J. C. Watts, when he was interviewed this past Sunday (April 29) by Craig Oliver on CTV’s Question Period. He was referring to the two major American political parties, the Republicans and Democrats. Watts is an unusual fellow. He is a black Republican. He played football for the Ottawa Roughriders a couple of decades ago. 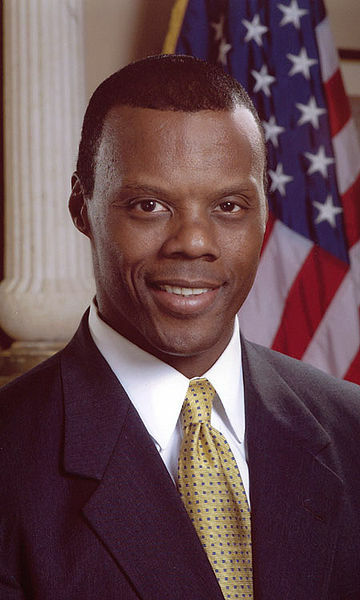 Post-football, he became, first, a Baptist minister, then a member of the United States Congress and finally, a business consultant to several large American corporations. His rhetoric is moderate. To some, he is a contradiction because blacks, in their view, are supposed to be Democrats. He wears his Christianity on his sleeve, but tempers it with some of the modesty that might have come from playing his entire professional football career in Canada. He grew up in happy poverty in Oklahoma. He married one of his high school sweethearts, Frankie Jones and has six children. All of which brings us back to this past week. Watts was in town as the keynote speaker at the Maple Leaf Dinner, a right-leaning fund-raiser for the Canadian Centre for Policy Studies. Master of Ceremonies for the event was Senator Mike Duffy. The evening’s collective honouree was Sun News, cited for its new and different approach to the Canadian political media scene. We had hoped to go but other considerations got in the way. That is why I was happy to see Oliver’s interview of Watts. The above quote about the two American political parties being “totally invested” in the failure of their opposites seemed like a good kickoff for a brief consideration, today, of the fact that, this week marks one year since Stephen Harper’s government found its majority. There have been a number of pundit-spawned assessments of the past year. Understandably, each assessment presents Harper in a different light. Conventional wisdom has it that Canada’s political parties have death wishes on each other. Some of the most critical of Harper suggest that he is to blame because he is so (take your pick) hard-assed, anti-democratic, secretive, morose, dictatorial, bullying, control-freaked or all of the above. I see it a little differently and I admit my bias. I have often suggested that Harper governs collaboratively. That said, he is a tough negotiator and insists that people on the other side of the table make their arguments succinctly and without wasting a lot of time. He encourages the opposition to try to oppose without being obstreperous or obstructionist. Some of his critics both on the other side of the house and in the media, spend large amounts of time trying to impugn criminality on the Harper government. They not infrequently take the approach that the government of the day is guilty until proven innocent. I would suggest that the opposite is the more ethical approach. Having said all that, I would suggest that neither the government nor the opposition is totally to blame for the sometime rancorous level of debate – even in the majority house. At the risk of showing a Pollyanna streak, I would, as I am wont to do occasionally, urge the kind of democratic reform that removes the worst of the adversarial aspect of our parliamentary system. I am not enough of a psychologist or sociologist to figure out just what needs to happen. I don’t thinking spiritual revival in the land is the answer, like some theocrats might, because even people of faith are thoroughly divided on the exact shape of revival. But I believe that if we could take to heart J. C. Watts’ regrets about political parties being totally invested in the failure of their opposites, we could start to see the way clear to spend more time building each other up. One of the requirements of my current studies is to read a book called Emotional Intelligence 2.0, by Travis Bradberry and Jean Graves, and to take some tests designed to help me understand the roots and directions of one’s emotional health. As it happens, the author of that blurb was also a visitor in Ottawa last week. He goes by the title of The Dalai Lama.